Get your Back To School Shopping done at Hudson's Bay! 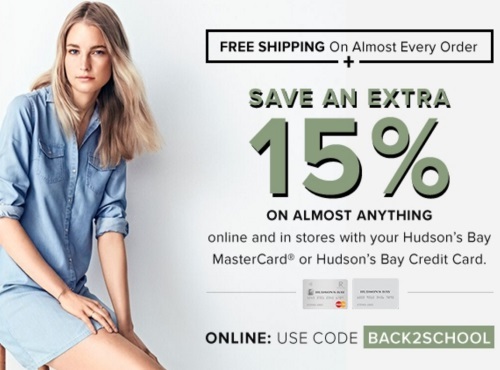 Save an extra 15% off when you pay using your Hudson's Bay Mastercard or Hudson's Bay Credit Card! Also, get Free Shipping on almost every order! No promo code is needed. Enter the promo code BACK2SCHOOL at checkout to get this offer. Offer ends Sunday, August 28 at 11:59pm ET.